Since our move to DeKalb, I've been dealing with a "dark kitchen". Ugh, don't you know I'm old and blind. I NEED light, lots of light. Then the time changed and it gets dark at 5:00 p.m. and now my kitchen is even darker without light coming through the window over the sink. This is the dark kitchen before. So my mission over the past weekend was to Light Up the Dark Side Kitchen. 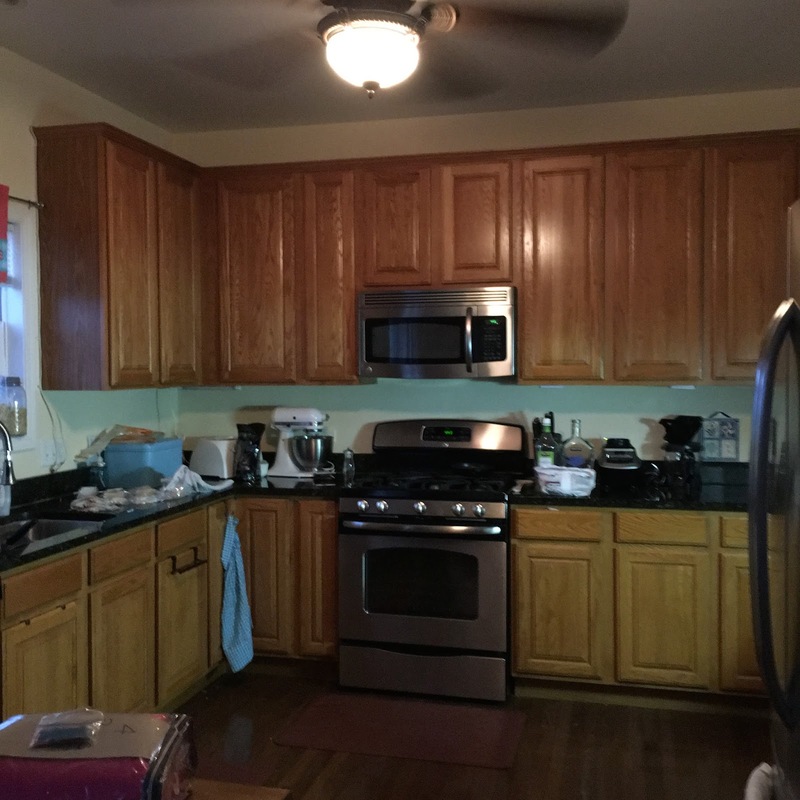 You can see the black counter tops don't help either. My window is just the left of the photo. 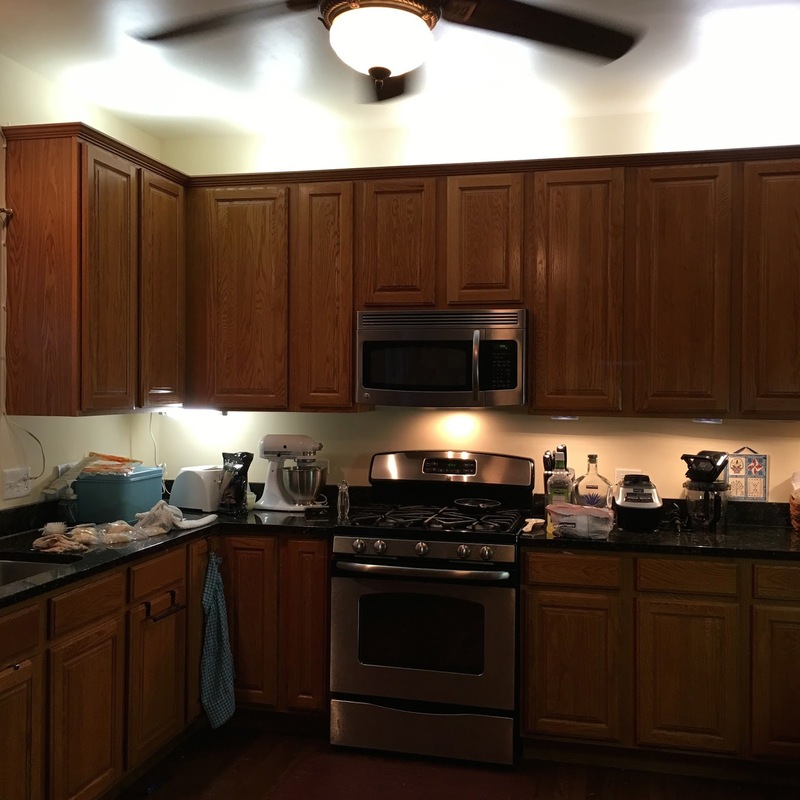 I installed florescent lighting under the cabinet in the corner, and to the right of the stove. I installed more florescent lighting at the top of the cabinets too. I had the King check the lights in the ceiling fan. Surely some of them had to be burnt out. Nope, but they were all lit up but they were only 40 watt light bulbs. Who designed that ceiling fan? Or better yet, who made the decision to install it in a kitchen. It's a beautiful ceiling fan/light fixture but no wonder my kitchen is so dark. I had him replace the bulbs with 60 watt bulbs. It was the largest watt bulb that is available for the small socket. Here is the update. My first thought when reading this was - under cabinet lighting. Looks great! My kitchen is not as dark as yours, but because of age and a few eye surgeries, I have to keep a small LED flashlight handy so I can use it to see in my lower cupboards.